It's nice and sunny out, and later the temps will get just above freezing. I can't wait for the snow to go away. Mom says the high temperatures next week will be above freezing. Whee! Mom and I are gathering weather data so we can help you with your When When Contest guesses. OK, Mom's been gathering data on the computer, I've just been looking outside. The average High temperature for January around here is 33F. This year the average high was 29F. The average High temperature for February around here is 34F. The numbers aren't in yet for this year, but so far we are almost 30 degrees colder than normal, on average. The average Low temperature for February around here is 16F. Again, the lows have been a lot lower than normal. The average High temperature for March around here is between 43 and 45F. The average Low temperature for March around here is between 22 and 24F. The snow will melt, and it will melt this year. When will it all melt? We don't know. Mom says that if she had entered the When When Contest, she would have lost every year, so your guess is as good as ours. The Contest will start on Sunday, March 1. Thank goodness I have lots of warm places to nap. After Mom shoveled the driveway yesterday, and took pictures of the house, she went up on the roof and shoveled the snow off that. 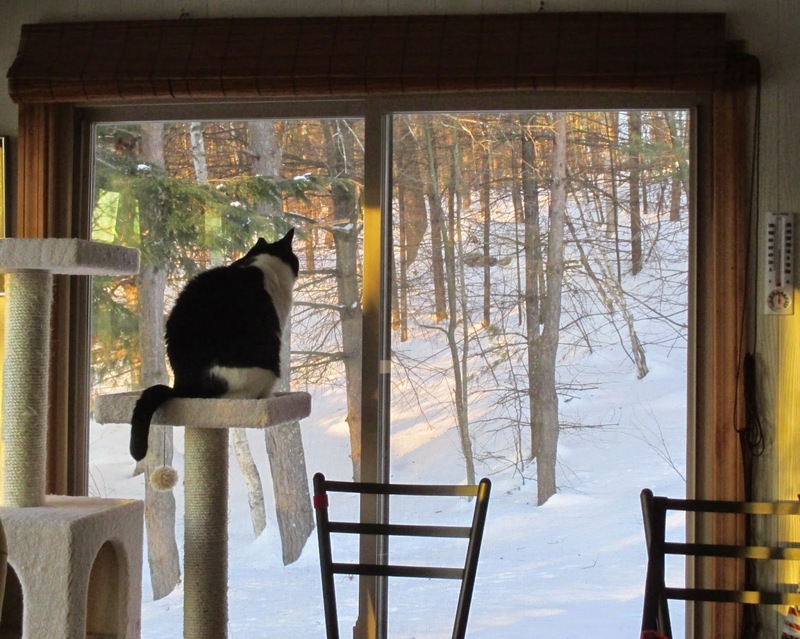 She cleared the vents and the skylights, and now the house is even more surrounded by snow. She went to bed early and did not stay up to watch that Oscar guy. That's like, thirty degrees warmer than it was yesterday morning. In New England, this is a HEAT WAVE. Crusty New Englanders drive around with the windows open on their metal masheens on a day like this. They walk around with their coats open, and their gloves off. Mom took some pictures of our house so you can see just how much snow we have. We live on a hill, and when you come down the hill, this is what you see. It'll probably get colder tomorrow, but for now it is fun to watch the snow melt. Don't worry, there will be plenty for the big contest. It will start one week from today! It's sunny outside, sure, but it's also Minus 6 F. That's Minus 21C for my Aussie and Kiwi pals. It's what New Englanders call "Wicked Cold." Actually, Mom has a different word for it, and it's right at the top of the bad werds list, so I can't put it here. It's supposed to rain tomorrow. Go figure. Well, most of them are gone. It was a bit "warm" yesterday (25F) so Mom opened the windows, removed the screens and smashed the icicles with a hammer. This was the view outside our front windows this morning as the sun was coming up. Four inches (10cm) of the fluffy white stuff fell again last night. How much snow is there? Too darn much, according to Mom. Can Spring really be thirty days away? The good news is the When When Contest will start on Sunday March 1. Stay tuned, kits and cats! It's still super cold out, so naturally I have found a nice warm spot for napping. We have lots of snow, as you can see. and sure, it's sunny. That's nice. But. It's cold out. Really cold. Dangerously cold. There are 32 days until Spring. I can't wait. This is looking out the kitchen window. (Yes, I know the pile is bigger because the snow was pushed off the roof, but still.) The indoor/outdoor thermometer is buried in the snow, and is registering a "toasty" 27.5 degrees F, but Mom says it's really 17F outside. The snow is so deep, it covers the bushes outside the front window. We don't have a carport, we have a car tunnel. That's my sweetie, Monty Q, with one of his little sticky people. Lookit how Monty is the pillow for the little sticky person. Now that's Love! 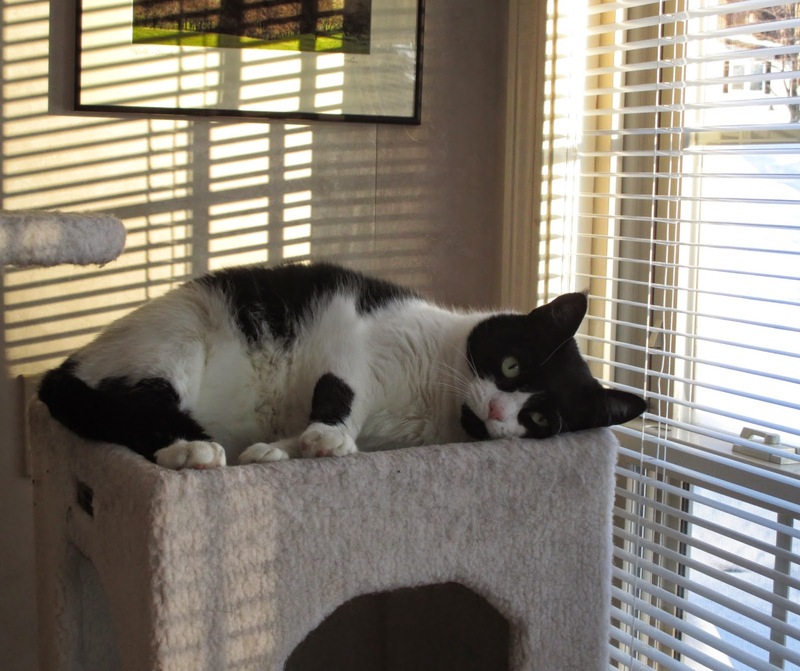 With all the snow on the ground, and the temp outside of 4F (feels like -13 (-25C) with the wind), I cannot tell you how happy I am to be formerly feral. I am so glad I have a nice warm home with a loving Mom who spoils me with love. 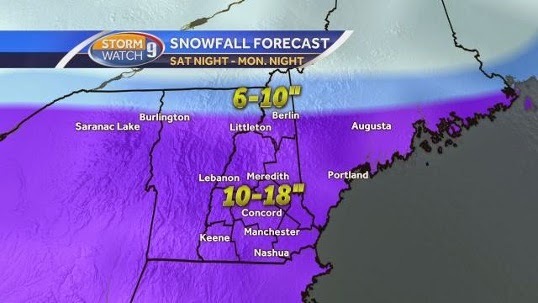 You probably won't be surprised to hear that we are supposed to have MORE SNOW on Saturday night. That's one of the few times I am glad I don't have opposable thumbs, because I'd be asked to help shovel the stuff. Too much what, you wonder? Too much snow, of course. We are supposed to get more tonight and we might have another big snowstorm over the weekend. The only way to deal with it is to find a good place to nap. We have lots of snow. The snow is so high, it reaches the bottom of the kitchen window. Yeah, it's pretty and all that stuff, but Mom and everybody else in New Hampster is totally over it. We'll give it away to anybody who wants it. Even Mom has given up and she stayed home from day hunting today. It's not that we haven't had this much snow before, it's just that this is the most snow we've ever had in just two weeks. It WILL melt. You know, eventually. It's snowing, as you can see, and it should snow all day today, all day tomorrow, right into Tuesday. And this is really the only way to deal with it. Mom says the English Muffin Bread is wicked easy to make and doesn't require any bread making skill at all. Mom had a cooking blog for a while. A lot of her favorite recipes are there. Mom got up this morning, fed me my stinky goodness and crunchies and then opened the door to the Sewing Studio. I went right out there to check out my domain. Mom went into the kitchen and started cooking some gar-ban-zo beans. Then she made some corn bread and stuck that in the oven. While that was smelling up the house she made two loaves of her English Muffin Bread. Then she went food hunting. When she came back, she was in a hurry, so I knew she was going to go right back out again. She put the foods away and then took Mim-may to the quilt shop in Henniker where she brought one quilt for them to hang on display, and took another one home. She brought Mim-may to buy a few groceries and then they got the metal masheen washed. While she did that, I did this. Back at home Mom made some granola and is finishing cooking the gar-ban-zo beans. I am still doing this. We are expecting more of the white stuff, so neither of us will be doing much. We have now had as much snow as we usually have ALL WINTER LONG. Mom says winter isn't even halfway over. Mom and I are both happy the weekend is almost here. She wants a few days to relax. Last weekend she taught a class on Saturday and then watched the Super Bowl on Sunday and she says both those things stressed her out. Of course, the almost two feet of snow we got this week didn't help. And guess what, kits and cats? We have what the weather guys are calling a "long snow event" coming over the weekend into Monday. That means more snow, although it won't fall as heavily. And it will be furry, furry cold, so it won't be any fun to go outside. Here's what it looks like outside our house this morning. See how the snow is almost as high as that metal masheen? Yeah. And on these houses with almost flat roofs, that much snow isn't good. Remember I said the snowplow lady cleared ours off last weekend? Well, she will have to do it again in another week. Some of our neighbors have had their roofs cleaned off too. I have a front row seat to watch. Yup, it is snowing again. And I am at the very top of my kitty condo (where Mom has never seen me before) watching the snow fall. If anybody was wondering IF we would have a When When Contest this year, these photos should allay your fears. This is Mom's metal masheen under the carport. You can see the snow all around it. The snowblower lady cleared the snow off the carport roof, so there isn't as much snow up there. Our new house has something called "Central Air." Mom says that means the house won't get hot in the summer. The central air monster lives outside, and here it is covered in snow. This is what it looked like yesterday afternoon after Mom got home early from day hunting. It wasn't done snowing, but Mom decided to act like a cat and take a nap and when she woke up it was too dark for pictures. Except for one of me.